I had never visited Japan until a few months ago when I was invited by Seiko to join a small group of journalists to view its various production facilities. Landing at Tokyo’s vast Narita International Airport, I did not know quite what to expect. Presenting my passport to the immigration officer I was met with a beaming grin and a polite greeting, setting the tone for a wonderful trip. Indeed, this notable degree of friendliness was omnipresent during my visit to the land of the rising sun. The weather, by contrast, was less than friendly as the black foreboding skies unleashed colossal quantities of rain. Moreover, with Typhoon 18 scheduled to arrive at any moment, I boarded the Shinkansen Bullet train to Morioka seeking to escape its menacing powers. We serenely travelled at speeds approaching 200mph, leaving the typhoon in our wake. This train travels on tracks which are welded together, absent of joints, delivering a smooth, quiet ride. Interestingly, the trains were a perfect illustration of how Japan adopts its own route to creating objects. Whether it is food, beer, cars or, most pertinently, watches, this is a nation that chooses to tread its own path, producing items that have a distinct character all of their own. The gleaming factory of Morioka Seiko Instruments Inc. nestles within a forest and is located beneath Mount Iwate. Near the entrance to the factory, a sign details the various flowers, birds and other wildlife on the company’s grounds. It is clear the company wishes to cause minimal disruption to its environment and has empathy for the surrounding landscape. This trait seems to be shared with the general population of Japan and appears to have its origins in Shinto, Japan’s native belief system. Prior to my visit to Japan, I wrongly assumed that Seiko was merely one company. It is not. Seiko comprises several companies, some of which belong to Seiko Holdings, some of which are owned by Seiko Epson. 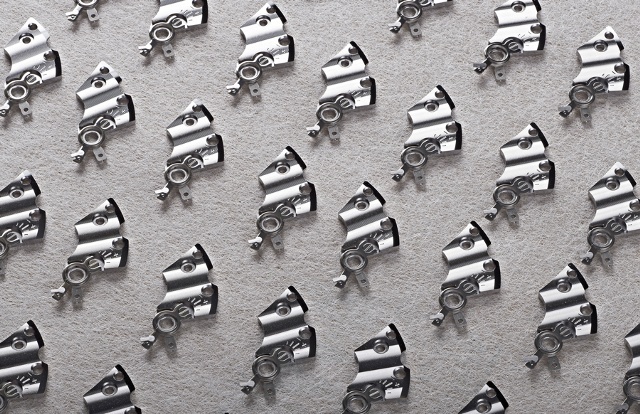 Morioka Seiko Instruments Inc. is responsible for the production of various mechanical watch components, complete mechanical watches and the production of watch movements. 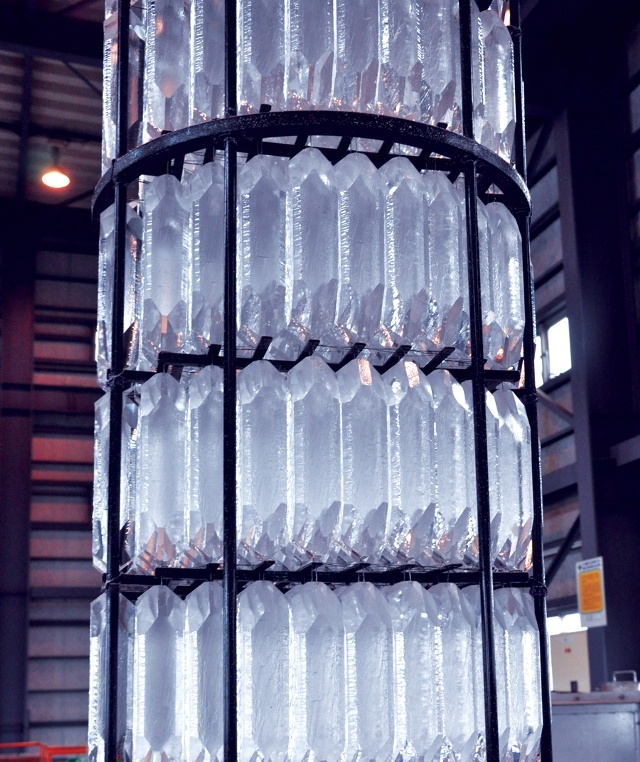 To highlight the scale of the operation, one room, producing non-branded quartz calibers for third parties, creates ten million movements per month. The enormous scale of this operation cannot be overstated. But I found my natural home within the Shizuku-ishi Watch Studio within the confines of the Morioka factory. The Shizuku-ishi Watch Studio is reputedly the one and only fully integrated manufacturer in Japan for mechanical watchmaking. Touring the facilities, I saw an array of stamping and CNC machines creating movement components with sub-millimetric precision. Bridges, levers and wheels are all produced in-house. The company produces its own hairsprings, a capability envied by many watch brands based in Germany and Switzerland. Passing through a clean room, blowing the body free of any potential contaminants, one enters the movement and watch assembly department. Skilled watchmakers sit at customized workbenches, made specifically for each artisan, ensuring optimum ergonomics. Each workbench states the name of the watchmaker and, in some instances, is marked with a Meister sign. A Meister is the appellation awarded to the most competent and skilled artisans at Seiko, graded in three tiers: bronze, silver and gold. There is a strong sense that skills and techniques are passed down from one generation to the next. The studio produces both Grand Seiko models, including its highly prized Hi-Beat models, together with some ultra-thin Credor watches. While I am familiar with Credor, it is not a brand I often see in my native England, as the strong following in Japan means virtually all of the production capacity is consumed domestically. 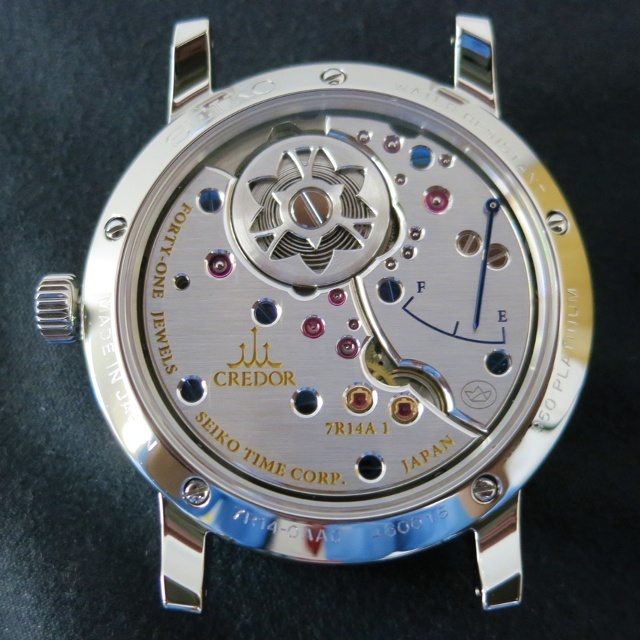 I was particularly struck by the beauty of a Credor ultra-thin movement. The openworked and engraved caliber exemplifies the exalted craftsmanship practiced within this atelier. The engraved decoration found on the ultra-thin platinum watch is intricate and exquisite, all imparted with a hand-held burin. A personal highlight of my time at the Shizuku-ishi Watch Studio was handling a Calibre 9S86, found in the new Hi-beat GMT, launched at Baselworld 2014. 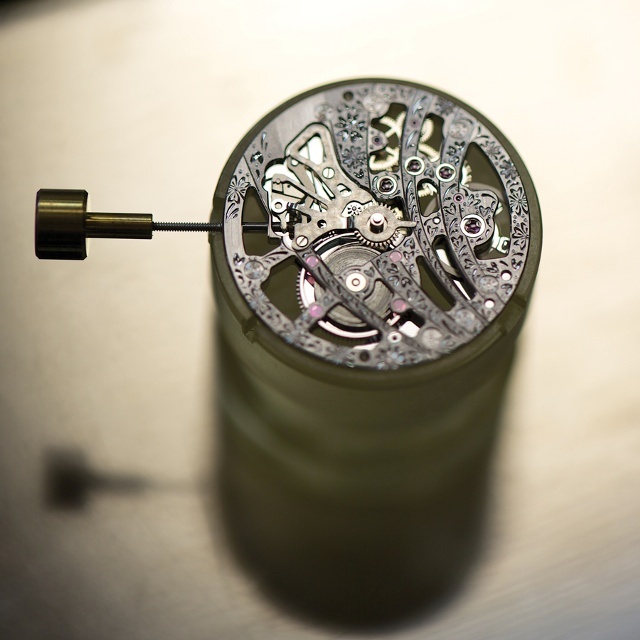 Close examination of the movement using a microscope revealed faultless finishing. The oscillating mass and bridges are decorated with a striped pattern, similar in concept to the Côtes de Genève motif, but with a distinct character all of its own. Each stripe is crisp and beautifully defined. Each bevel evinced a brilliant gleam, free of twisting or distortion and executed to a matchless result. 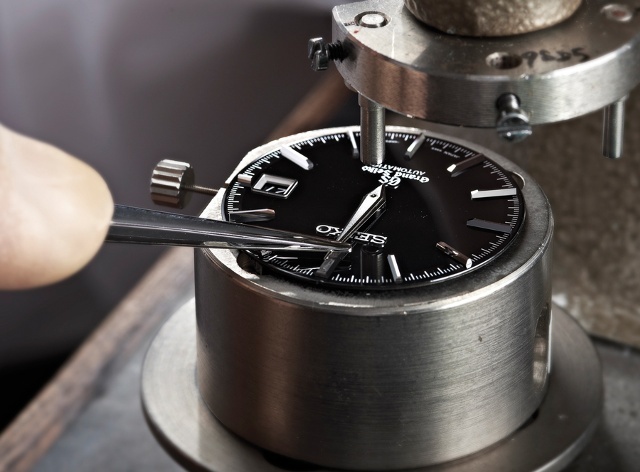 In addition to flawless finishing, the watches are also subject to exhaustive testing. In a small room, adjacent to the assembly area, watches are subject to pressure tests, immersion tests and drop tests, all designed to confirm the specified water resistance. Uncased Grand Seiko movements are checked for rate keeping in six positions and at three different temperatures over a seventeen-day period. Once cased, the accuracy of each watch movement is checked again over a further seven-day period. The mean daily rate is between +5 and -3 seconds under static conditions and +8 to -1 seconds in normal wearing conditions. Each watch is accompanied by a unique test certificate showing the results from the testing regime. Whilst the Grand Seiko Calibre 9S6 has a frequency of 28,800 vph (4Hz), the balance within the Hi-Beat model oscillates at 36,000 vph (5Hz), bestowing greater stability and accuracy. The potential downside of working at a higher frequency is increased power consumption and, by default, a reduced power reserve. 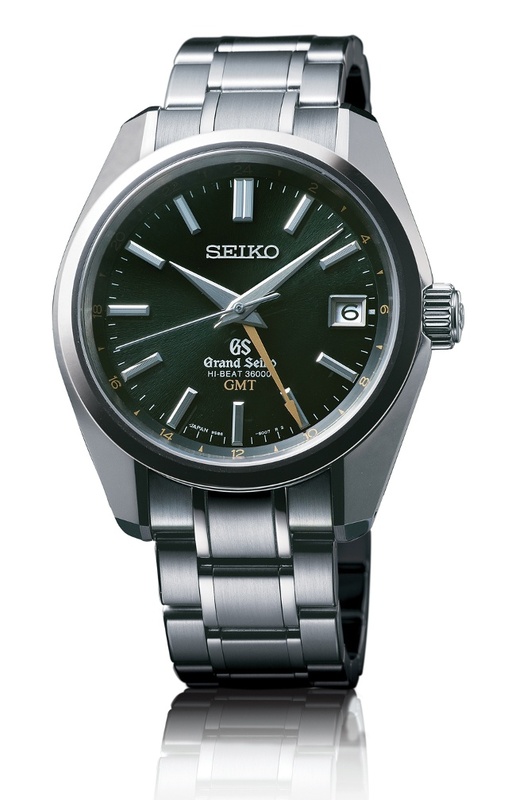 Grand Seiko uses SPRON530 for its in-house mainspring within the Hi-Beat. This alloy has incredible elasticity and, owing to its long, thin design, is able to deliver an impressive power reserve of fifty-five hours from a single barrel. My journey continued via bullet train to the Seiko Epson Shiojiri factory where Seiko produces Astron watches, Grand Seiko quartz and Spring Drive watches, the new Prospex diver’s watches and lastly, Credor Spring Drive models. I confess to not being a huge fan of quartz watches. Nevertheless, I could not argue with the accuracy of the Grand Seiko Calibre 9F, gaining/losing a mere ten seconds per annum. Furthermore, each movement is adorned with a series of decorative stripes, sating my innate need for faultless finishing. They are also assembled by hand, adding a quotient of desirable craftsmanship to the mix. Seiko Spring Drive is unlike any other watch movement. A Spring Drive watch harnesses mechanical power within a mainspring. In some cases this power is imparted to the mainspring manually, through conventional winding or, alternatively, via an oscillating mass, typically found in normal automatic watches. Where Spring Drive differs is that it does not have a conventional Swiss lever escapement to proportion energy. A small amount of electrical energy is produced by a glide wheel and coil block. This electrical energy is then used to regulate the speed of the glide wheel, similar in appearance to a conventional balance wheel, by creating an electromagnetic field, effectively braking the glide wheel and regulating the unwinding of the mainspring. 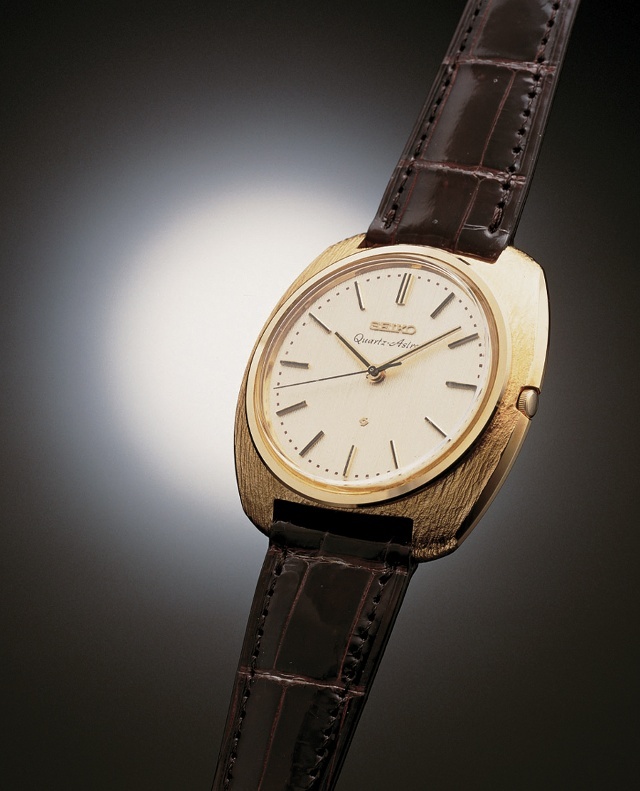 Seiko Spring Drive can trace its origins to a young engineer, Yoshikazu Akahane. This inventor of Spring Drive sought to achieve levels of accuracy previously only seen in quartz-powered watches, yet powered by a mainspring. His journey commenced in 1977 and took more than twenty years of research and development, together with more than 600 prototypes, before he attained his goal in 1999. Despite the modernity of Spring Drive, Seiko has not abandoned traditional watchmaking craftsmanship, with fine finishing much in evidence on its in-house movements. Moreover, the chronograph models feature a column wheel with vertical clutch. The Astron GPS watch, launched in September 2012, was the world’s first GPS Solar Watch. Ironically, it adopted a name that came to prominence in 1969, when Seiko used the soubriquet for the world’s first quartz wristwatch. The Astron receives signals from four or more GPS satellites, pinpointing the location of the wearer and automatically adjusting the watch to local time. Accuracy is a desirable goal for any watch brand. However, the Astron usurps every other timepiece on the market, including the brand’s legendary quartz models. The solar powered watch is accurate to one second every 100,000 years, benefiting from the timekeeping prowess of the atomic clocks found in each GPS satellite. High energy consumption surfaced as a potential problem with the GPS Solar watch. But Seiko, a brand that has never shied away from technical challenges, created an energy-efficient GPS module. While the initial 7X series models are large, the newer 8X models launched in 2014 are somewhat smaller and thinner, measuring between 44.6mm and 45.0mm in diameter. Nonetheless they are far more efficient. The newer Astron consumes only 60% of the energy of the 2012 model. With this colossal technical mastery manifestly on show, one would expect the Seiko personnel to be a tad smug. However, the reverse proved to be the case. There was a charming modesty in every fact proclaimed during my visit, and yet I also sensed a hunger for continuous improvement wherever I looked. 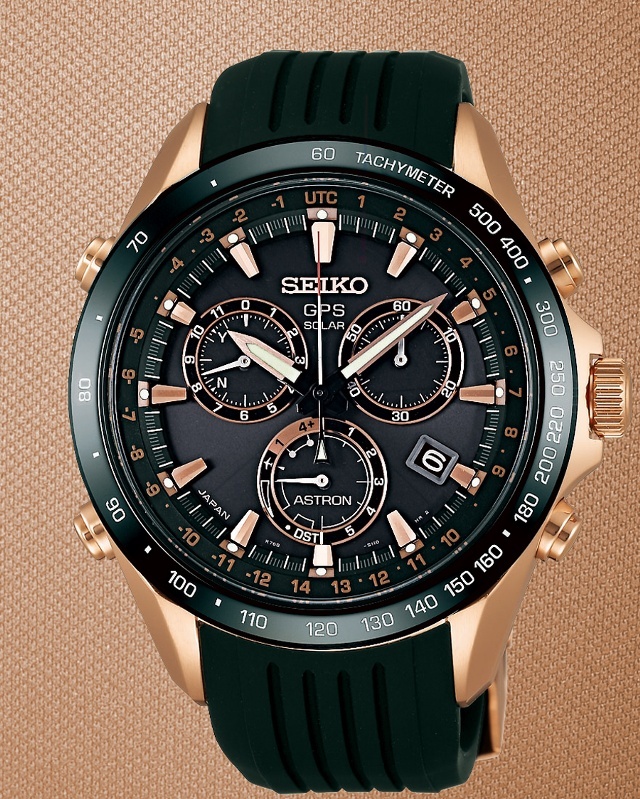 Credor Spring Drive models represent the ultimate expression of Seiko ownership. They are produced in a small department, the Micro Artist Studio, by a small group of talented artisans. Earlier this year, I had the absolute joy of hearing the Credor Minute Repeater. The sound of the hours, quarters and minutes being chimed was truly mesmerizing and totally different from any minute repeater I had heard before. The complication employs two hammers and two bells, producing a clear, crisp sound. It draws on the expertise of forging techniques typically used in the production of Myochin bells. Credor has recently revealed a new model, the Eichi II, a dress watch, presented in a platinum case and measuring 39mm in diameter. The inventory of functions is limited to hours, minutes, central seconds and a power reserve indicator on the movement. However, the means by which it converses with the wearer is exquisite. The hand-wound movement is exquisitely finished. During my visit to the Micro Artist Studio, I noticed a picture of Swiss watchmaking legend Philippe Dufour on the wall. I was surprised to learn that several of the artisans working within the Micro Artist Studio have visited Switzerland and spent time with the great man. Moreover, Dufour has even sent small quantities of the wood from the forest near his workshop, ideally suited for performing the matchless movement polishing I found myself admiring. 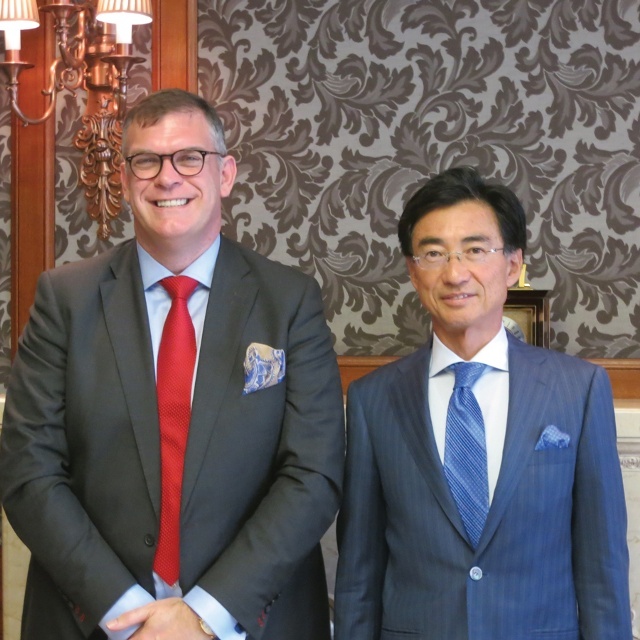 The culmination of my sojourn in Japan was an interview with Shinji Hattori (above, with me), the President & CEO of Seiko Watch Corporation. Hattori is a direct descendent of Kintaro Hattori, the man who founded Seiko Holdings Corporation in 1881. Hattori explained that Seiko has increased production, trained more watchmakers and invested in new facilities. He added that his company will concentrate on mechanical and Spring Drive models for international markets, something that will please my fellow admirers of these remarkable watches. I asked him if he ever considered offering other complicated timepieces in the future, perhaps even a grand complication. He replied (with a smile) that he was not able to talk about details of any upcoming developments at that particular point, but he added that the Eichi II will be making a public appearance at Baselworld 2015. 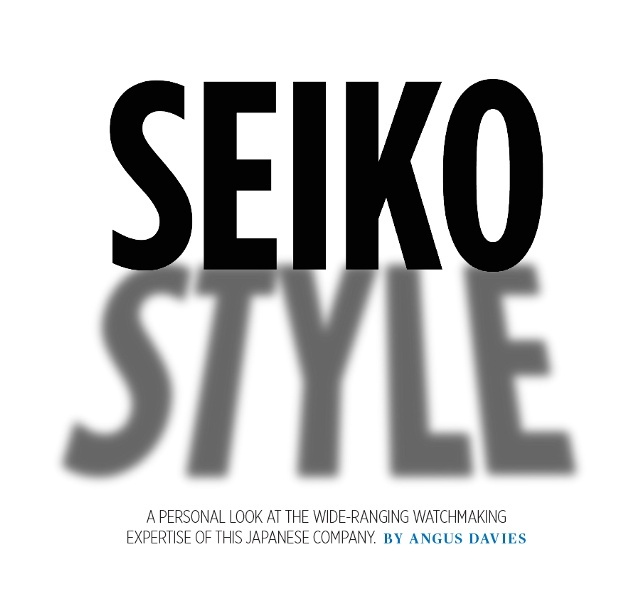 I will be keen to see what horological marvels Seiko will display at Baselworld 2015.